Is Brian Kelly a DINO? Answer: That is a great question. I may not know the answer to that question but I will tell you how I feel. A long time ago, when I was a kid, I believed the Democrat party was the party of the people. Though I started out as an Independent, I became a Democrat in my early twenties because of the principles of the Democrat Party. My father believed in those principles and he taught me them at the time from his perspective. Democrats represented the ordinary people and the Republicans represented business. The people needed good representation from the Democratic Party because business already had the Republicans. It was that simple until the notions of conservative, liberal, and socialist /Marxist / progressive entered the picture. I am not liberal. I am not socialist. I am conservative. I guess we would have to ask the party leaders if there is room for good ole conservative thinking Democrats in the Party today. I was never a Party organizer nor have I had any real affiliation with how the platform of the Democratic Party is created. Yet, over the years as it has evolved, I know enough now that I have concluded that the platform has a rotten smell. I see more and more Democrats switching to Republican, not because they are pro-business per se, but because they are conservative and the hard left of the Democratic party mocks conservativism. Because of this, more and more Americans who were Democrats find themselves aligned with the people-oriented values of the TEA Party. Though there is no official word, there apparently is no room for conservative thinking in today's Democratic Party and I hope to change that. The fact is the Democratic Party no longer espouses the values in which you and I believe. The Democratic party is no longer for the people. The Democratic party is no longer for the worker, unless the worker is unionized. The Democratic party chooses the rights of illegal foreign nationals over American citizens. If you choose to work, the Democratic party does not seem to include you in their thinking. It's not only time to change the Country; it's time to change the leadership of the Democratic Party so that it again represents all of the people, not just those with a hard socialist / Marxist / progressive agenda. The Democratic party wants to take from the workers today and give to the non-workers and even illegal aliens and, they want to give the non-workers far larger amounts of your salary than needed to sustain life. Ironically very few of the top Democrats in the party give very much to charity. They are as cheap as it gets. They expect the common man to carry the load rather than the elite. If you work, with the Pelosi / Reid Democratic party, you better hang on to your wallet. My father, who was my mentor on politics, did not like the slide the Democrat party began to take against the working man. It seems that they began to include everybody who was not a regular worker into the fold -- apparently for the proposition of gaining more votes. My knowledge of the people of NEPA is that few Democrats are like the San Francisco hard left who now control the party. NEPA people do not think the way Nancy Pelosi and Harry Reid think. There is perhaps at least one man in NEPA who thinks the same way as Nancy Pelosi and Harry Reid . Senator Robert P. Casey Jr. not only votes with Harry Reid most of the time but he also voted for Harry Reid, the most liberal guy in the sanate, to be the Senate Majority Leader. Along with being just one of seven senators who supported Acorn, in April 2011, Casey said he would not vote to block funding for Planned Parenthood. Moreover, he is a steadfast supporter for Obamacare and energy cap and trade. The Senator voted against the repeal of Obamacare. Bob Casey has forgotten that he is from Pennsylvania and he has voted against US on a consistent basis. Maybe he plans to move to Nevada or San Francisco to be closer to his friends. Instead of Democrats thinking that I am a DINO, I'd say I am a more traditional Democrat. I am my father's type of Democrat when they party had some self-respect. The Senator from Pennsylvania, however, Robert P. Casey Jr. is the real DINO. He has become a San Francisco hard leftie. He has developed a deep affection for socialism, Marxism,, and progressivism. He is not for the workers, seeking the American Dream in a Capitalist society. With his views on energy, he has little approval for the capitalism, and likes the redistributive model where the workers supply the food and shelter for the non-workers. With socialism, history tells us there are only nightmares. Many deaths are necessary on any road to soicalism / Marxism. Robert P. Casey is not the darling of Democrats who are pro-life because he is pro-Obama, and pro-Obama means pro-abortion and not pro-life. My father and Casey's father were great pro-life Democrats, carrying the pro-life mantra wherever they went. I have been a regular at the pro-life rallies in Washington DC for about thirty years now, and I cannot recall Robert P. Casey Jr making the trip. After the March, Kevin and Hugh Kelly from Kelly's Irish Times in Washington DC remember us and our libations, Harp and John Jameson, and sometimes a little Tulley. 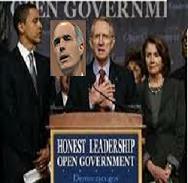 “Tone deaf doesn’t even begin to describe Senator Casey’s vote for Harry Reid as Senate Majority Leader,” Barley said. “Just two weeks ago, Pennsylvanians sent a clear message to Washington, D.C. that they were tired of the wasteful spending, big government policies and failed agenda of President Barack Obama, Senator Harry Reid and Speaker Nancy Pelosi. I guess Bob Casey didn’t get that message! " Casey gets few messages and when he does respond, he tries to convince you that you are wrong and he is doing what you want -- but you just don;t know it. A letter from Robert P. Casey, is a waste of paper indeed. When it is campaign time, like now, we may even get to see our Senator, though during the Town Hall summer of 2009/2010, Robert P. Casey Jr. was not within earshot of any constituents. Casey hides from the real battles. And when he is in public view, we may find our Hard Leftie appearing to be ambidextrious. Because of this, you must remember his record. -- He failed us every time it mattered. Unlike his dad, who was not a DINO, Casey voted against NEPA but somehow always had time to muster a vote for the concerns of his favorites from San Francisco and Nevada, Nancy and Harry. Why should any of us want to give up our hard earned healthcare and workplace rights so that some politician someplace can have a better life? If you read this site and perhaps one or several of my books, you will see that before Obamacare, everybody had healthcare and this whole thing is an opportunity for the Socialist / Communist part of the Democratic Party, of which Robert P. Casey Jr. is a registered member, to gain control and never have to let go. When they get full control, and I am running for Senate so I can stop that, there will be no freedom or personal liberty for any of us. No, I am not a DINO. Look to Nancy Pelosi, Harry Reid, and Paul Robert P. Casey Jr., and you will find living breathing DINO's. But, don't get too close. They don;t think like US. I know I am not a Republican because I do not own a business with employees and I do not make a real ton of money -- maybe a quarter ton in a lifetime. I am not against making a ton of money as I think that is the American Dream for all workers. Socialism is the great dream remover of our time, as it takes untamed Thunderbirds and makes Lemmings of them. Right now, the Republicans have a platform that makes a lot more sense than the Democrats unless you do not work for a living. Rather than become a Republican, I would rather stay a conservative Democrat. Rather than saying I am a DINO and thus worthy of expulsion from the Party, I repeat that Nancy Pelosi and Harry Reid and Robert P. Casey Jr. are the DINOs. From my set of mostly 20-20 eyes, they belongs in the Communist Party. The pack of them should leave the Democratic Party and leave it to real Democrats from the time when a Democrat was a Democrat. Let's get rid of all the DINOs! Harry Reid is another DINO, not far behind Nancy Pelosi. Nevada clearly thinks Harry Reid is a DINO, yet he has some friends in high places and he was able to get reelected though the odds were against him. Neither Nancy nor Harry, two radical socialists would be called led Democrats in days gone by. They'd be on the first bus out of town and my dad and your dad and Bob Casey Jr.'s dad would be the ones putting them on the bus. They should be sent home and there should be room in the Democrat Party for regular people, with real conservative real-people values. There is no reason for the Democratic party to admit certified hard left whackos and their whacko billionaire supporters. Again, let me say that I am not a DINO, But, if you are looking for DINOs, they are easy to find. Just search on Harry Reid, Nancy Pelosi, Robert P. Casey Jr., and Barack Obama, and you'll get lots of hits. They are DINOs worth removing so we can start this ship up again the right way. They have had their DINO days.